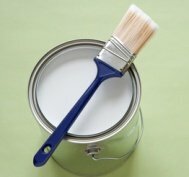 Can you paint over mold if you use mold resistant paint? We are asked that question frequently by homeowners hoping to cover walls or other surfaces discolored by mold and also hoping to kill any lingering mold and prevent its return. We never recommend painting over mold, though, not even with anti-mold paint. 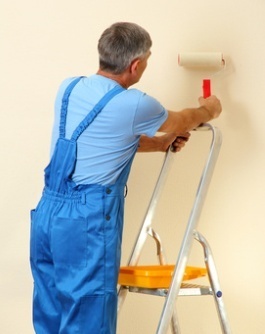 That type of paint will resist the development of mold if applied to a clean, mold-free surface. However, it will not kill mold already on the surface, at least not completely. What it will do is make it more difficult for you to see when that mold begins to grow and spread, which is sure to happen at some point, and therefore the mold problem can get much worse before you even notice that it is happening. So What Do You Do Instead of Paint Over Mold? Instead of painting over mold, remove as much mold as possible from a surface before painting it. Use an antimicrobial cleanser (we like Foster 40-80) and a brush to clean the surface thoroughly. It can be difficult or impossible to completely remove mold from porous surfaces like wood, and in those cases, professionals sometimes sand the wood to remove more mold. However, sanding moldy wood can be dangerous because it releases thousands of tiny mold spores into the air, so it’s not advisable to sand moldy surfaces if you aren’t a mold remediation professional. If you think a surface may need to be sanded in order to remove all traces of mold, call in a professional. Most offer free consultations, so you have nothing to lose. Just take advantage of some free expert advice. If you can’t remove all traces of mold from a surface, you can apply a mold sealant before painting the surface. Known as encapsulation, this process seals in any mold that cannot be removed, preventing it from growing and spreading. It also helps repel future mold from the surface. Before you paint over mold sealant, allow it to dry completely. Keep in mind, however, that mold remediation professionals recommend removing and replacing moldy materials whenever possible if they cannot be thoroughly cleaned; encapsulation should be a last resort. Professionals also recommend against encapsulating large areas of mold; use this technique only sparing if you must use it at all. Use mold resistant paint in areas that are subject to lots of moisture, like bathrooms and kitchens, in damp spaces like basements, and in any areas that have previously had mold problems. You can purchase paints designed to resist mold at most home improvement stores. These paints don’t guarantee mold won’t grow on surfaces, but they do help prevent it. Make sure surfaces are clean, free of mold, and completely dry before painting them. If you apply a mold sealant to a surface, allow the surface to dry completely before applying the sealant and then allow that to dry completely before painting it. If you need assistance with mold remediation, or need help sanding or encapsulating a moldy surface, you can schedule a free consultation with a mold remediation professional. A highly trained, experienced professional will visit your home, assess the situation, and advise you about how to proceed at no cost to you. Of course, you can then hire the professional to handle the job for you if you prefer, but even if you decide to do the work yourself, you’ll benefit from some free expert advice. Follow the link to find qualified mold remediation professionals near you. Never paint over mold. It will not kill the mold, and it will continue to grow and spread.